Okay, I am a sucker for a good title, and this book has a good title and a good cover. Win-win! And it is about Star Trek, which I like quite a lot. But it is rather deep at times, so I wouldn’t rate it five stars, but fans of Trek who have some knowledge of philosophy might award it a solid four, perhaps. What is between the covers is a collection of essays edited by Jason T. Eberl and Kevin S. Decker. These essays use Star Trek’s various television shows and movies to explore philosophical issues, and it helps quite a lot if the reader is familiar with all forms of Trek. Since I never watched all of DS9 or Enterprise, I was sometimes a bit lost. The first essay is a nifty one, as it is based upon a Next Generation episode, “Darmok.” Both the essay and the episode dealt with the difficulty of translating a totally alien language. Throughout most of the Trek episodes there was a “universal translator” which was a bit like Google Translate, but it depended upon languages having some commonalities. Of course, communication via such means can go astray quite easily, but what about an alien species that doesn’t communicate the way we do? The issues would be far beyond going from English to Chinese, and I understand that can be difficult. As the essays in this book are by different authors, the tone and topics vary quite a lot. For me, it was a book to nibble at, but not a cover to cover read. I’ve always viewed Star Trek as more intellectual than Star Wars, but this book takes it to an even higher plane. For fans of all things Trek, there are some really delicious ideas to examine in this collection, so if that describes you, go for it! After seeing the second Star Trek reboot, all I can say about the new Star Wars is that I have a lot of hope and fear. Hope that it will be worthy of the Episode IV-VI trilogy, and fear that it will be even worse than episodes I and II. I actually kinda liked Episode III. Harrison Ford looks older than dirt, but I’m not particularly young myself. Of course, any action will fall to the younger cast members, so let’s hope that the writers crafted them well. Abrams can make it look great, but if the writing is bad, nothing can save it. Mr. Nimoy, in black and white, for that is how I first saw him, on my parents’ old console television. He was in poor health, but really, I am feeling loss right now. As a youngster, I enjoyed TOS when it was first telecast, and I enjoyed it even more in re-runs when it was in syndication and I could watch it without any disparaging remarks from my father. (Nothing against dear old J.R. but he liked westerns, and just didn’t realize that Trek was a western, set in outer space.) And, Nimoy’s character, Spock, was just a lot more interesting than Dr. McCoy, Scottie the engineer, or even the feisty Captain Kirk. Lots of girls swooned over the intellectual Mr. Spock, and maybe that was part if the attraction, but I really think it was his brainpower that made me love the character of Spock. During my life, I only dated two young men for any length of time, both of whom had very dark hair and lots of brainpower, and I feel very fortunate to have married one of them! Anyway, I’m not sure how others will react to Mr. Nimoy’s passing, but for me his death touches my heart even more than the deaths of his co-stars, James Doohan and DeForest Kelley, or even the great bird of the galaxy, Mr. Roddenberry himself. I never met Leonard Nimoy, but I feel as if a long time friend is gone. Since I watched TOS countless times, as well as the movies, I suppose my feeling of loss is logical. We’ll miss you, Mr. Nimoy! Voyage Through the Stars—and Back in Time! My husband stumbled upon an episode of “Star Trek Continues” and after just a few minutes, we were hooked. This upscale “fan film” site is really something to see. There are only a couple of full episodes, but a fully funded Kickstarter campaign from last year should fund at least a couple more episodes. We really liked the loving homage of this effort. Seeing new episodes with the same music, similar storylines, familiar costumes and props, and amazingly original looking sets make this nothing like the “reboot” movies. These free online videos, which do include some shorter “vignettes” are made by a not-for-profit-entity, filming in Kingsland, Georgia, in a warehouse with 10,000 square feet of sets built to look just like the sets from 40+ years back. The actors do not just dress and look somewhat like the original series characters, but add their own interpretations as well. And, get this: the actor portraying Chief Engineer Scott is James Doohan’s son, Chris. That casting choice is far more authentic than the reboot’s Simon Pegg. 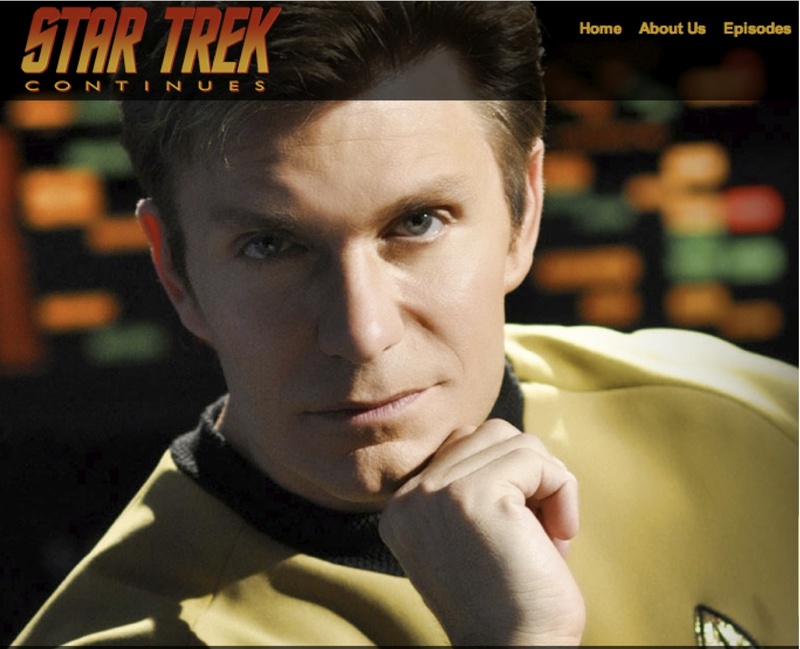 Kirk is portrayed by Vic Mignogna, a voice actor and director, and Todd Haberkorn is Spock. At first, seeing these different actors portraying well known (and loved) characters seemed odd, but after a few minutes, we were more interested in the story line than the actor’s faces and voices. There are some new characters, too, as the premise is that STC is telling the tales from years four and five of the “five year mission” that was only three years long in the original series. Had the series continued, no doubt new characters would have come along, so this concept works well. Fans of TOS should check out Star Trek Continues, because it is quite entertaining. My husband and I are hoping for many new episodes. And, as residents of Georgia, we are wondering if they are going to have another open house, as they did a couple of years back. I’d love to see those sets! Star Trek Into Darkness— yes, another review! More than two years have passed since I went to see a movie at a theatre. Oh, I have watched films, of course, but Netflix and Amazon Prime are my usual ways to see movies these days. For the new Trek flick, I made an exception. Mostly, I enjoyed this new entry into the universe of Star Trek. While I am old enough to have seen Shatner and Nimoy doing the original series first on its first run, I fully understand that if Trek is to reach current audiences, then it had to go through the reboot process. That, of course, means that many of the characters and/or situations will be revisited, but they will be “different” in some manner. And so it is with this yarn. Here is the usual spoiler alert. The opening is entertaining, but it trivializes Kirk’s decision to save Spock, while it presents a spectacle for the eyes. Almost immediately, Kirk is busted from Captain to cadet, which is hardly how the military works. After a crisis that is really not all that major, Kirk is promoted to first officer, and after his mentor is slain, he’s back to captain. This is in the space of a few minutes of screen time, and not a lot longer than that in real time. There is a scene on Kronos, the Klingon home world, but these fierce warriors have little to do, which is a disappointment. In the Star Trek universe, Klingons are awesome, but not in this film. After capturing the evil Mr. Harrison, Kirk assaults him with his fists. Yeah, he is the commander of the gi-normous star ship in the opening scene, but he resorts to fisticuffs. I could go on, but I think I have given sufficient evidence for my complaint about this film. Do understand that it is well-cast, exciting, and a visual feast. It pays homage to TOS, which is pleasing to older fans, and I count myself among them. Over a decade back, I read Donald Maass’ How to Write the Breakout Novel. In this highly instructive book, Literary agent Maass lets aspiring novelists in on several techniques for success, but one of the most important is to make every crisis a bigger threat, to make every hero larger than life. For a novel to “breakout” it must raise the stakes. Kirk and company seem to have lowered them in this film. Before it was released, there was some discussion of using terrorism as a plot device, as it seems to be an over arching theme for our world. Since entertainment is one of the chief exports of our country, it is important that movies, even Trek, sell tickets worldwide and not just stateside. But, by blowing up a Star Fleet “Archive” and shooting up a meeting of Star Fleet brass, rather than threatening a planet, a star system, or a galaxy, this film does the opposite of what Maass advises aspiring novelists. It certainly does not raise the stakes. Worse, the movie shifts away from an important premise that comes straight from Trek creator Gene Roddenberry, who was oft quoted as “looking for intelligence on the other side of the television screen.” Trek fans will have plenty of lines and situations to revisit in this tale, but little to stimulate their brains. That is unfortunate, because this film succeeds in many areas. Writing is just not one of them.